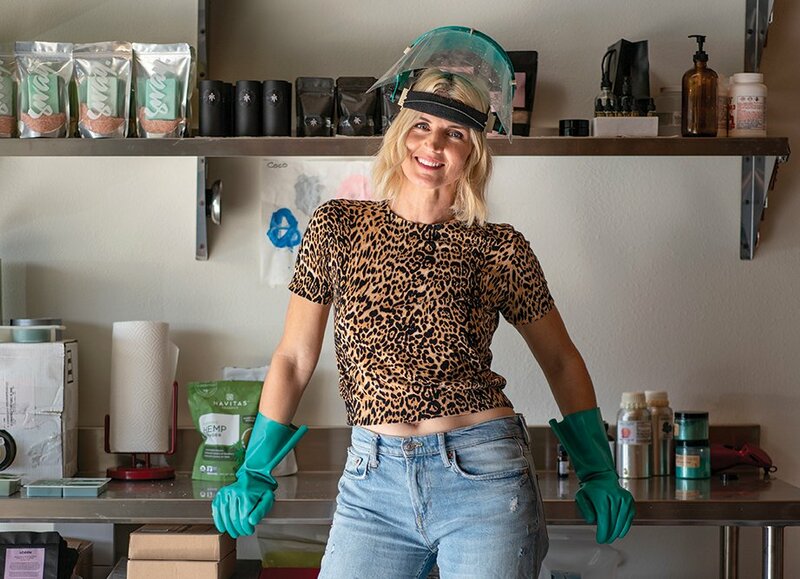 For our Secret Lives of Seven San Diegans feature, get to know Melissa McFarlin, a freelance graphic designer who found inspiration–and healing–in making her own beauty products. Excitedly explaining the benefits of clean beauty products while prying the lid off a bucket filled with raw coconut oil, Melissa McFarlin is completely in her creative element in her Carlsbad home office/soap studio (aka her garage)—electric blue rubber gloves, checkered slip-on Vans and all. Melissa has always walked the path of creativity; her father is a creative director and artist—some of his paintings are hung in her home—and she followed in his footsteps, getting a degree in graphic design and doing concept design for companies, before going freelance to spend more time with her children, Otto, 8, and Colette, 6. Her husband Clint is also a graphic designer. 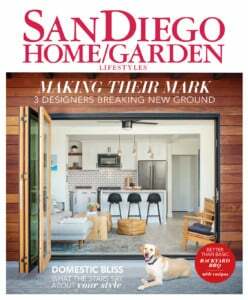 After feeling a “strong draw” to San Diego while visiting five years ago—and being especially enamored by the ocean—Melissa and Clint decided to move from Scottsdale, Ariz., to Carlsbad. A year later, Melissa developed hives that she attributed to a number of factors, but most importantly, the types of beauty products she used. Melissa pours the mixture for her latest batch of soaps into a mold. Once here, it firms for five hours. 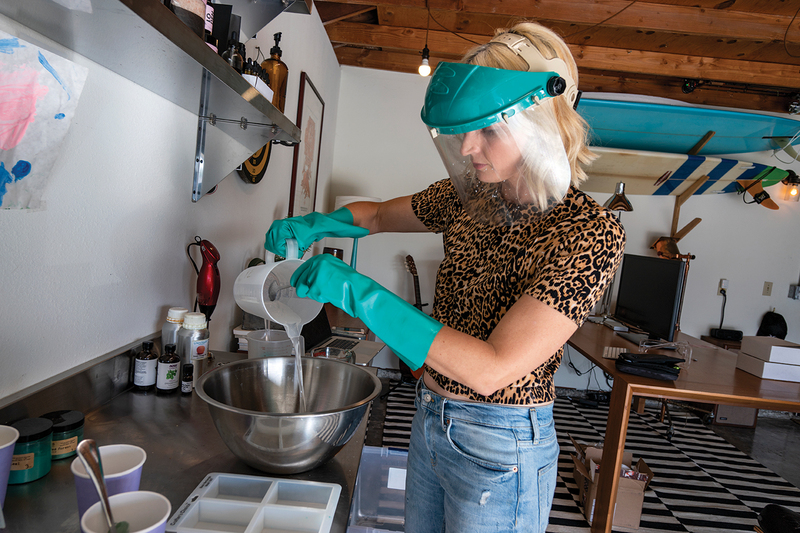 Melissa soon realized that creating her own soaps would be a lot more complex than mud masks and enrolled herself in classes at Lemon Grove’s Soapmaking Studio. This led to plenty of solo research on different soap-making techniques and the differences between homemade bars and mass-produced soaps. 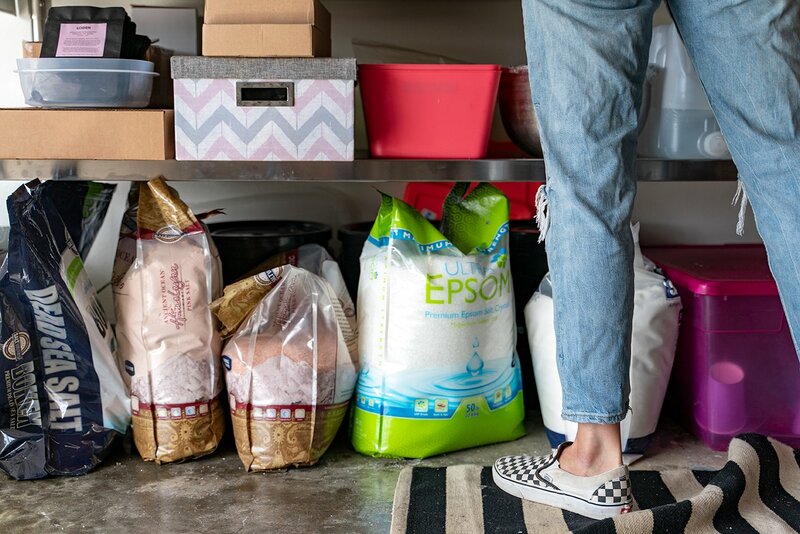 Big companies, for example, remove soap’s glycerin (a natural soap-making byproduct that moisturizes your skin’s outer layer by drawing water from the air) for shelf longevity. 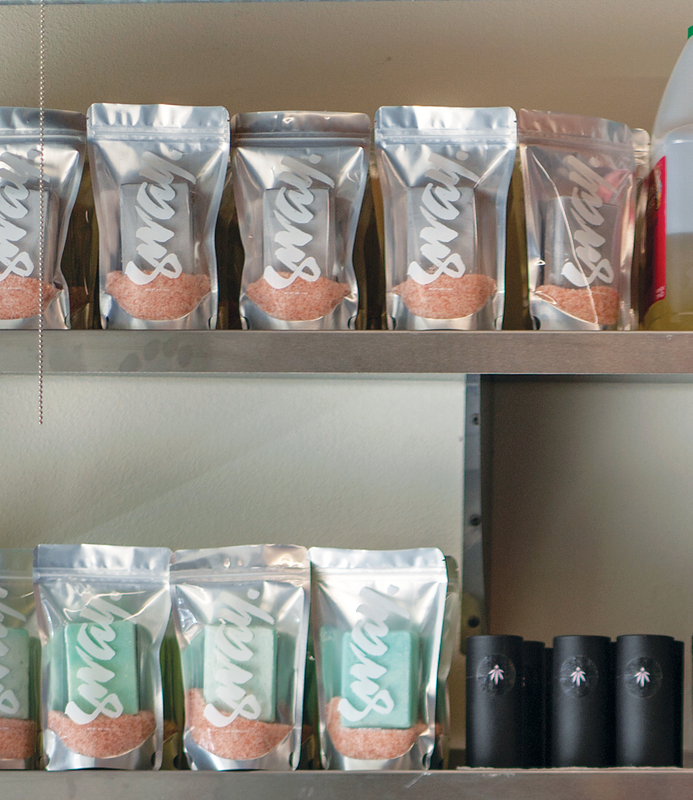 Melissa creates her soaps for Sway Sundries in her home studio. After some experimentation, Melissa arrived at her perfect formula: a blend of Dead Sea, Epsom and pink Himalayan salts. She uses a cold-process method influenced by classic European brine soap. In this technique, heated oils are mixed with a powdered-salt lye solution, then poured into a mold to firm for five hours. Once solidified, the soap blocks go through a four- to six-week curing process to evaporate excess moisture and create sturdy bars. Even though the bars contain salt, they are creamy, not gritty, yet still textured enough to be effective exfoliators. Natural supplies in Melissa’s soapmaking studio. Melissa designed her own eco-friendly packaging for Sway Sundries as well as for Loden, her line of CBD-infused beauty products. 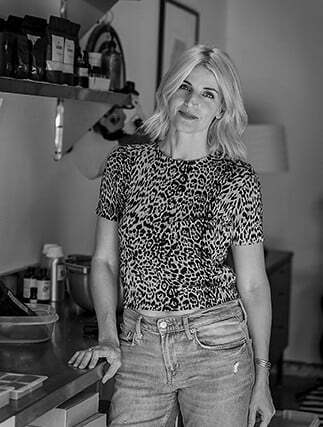 Supportive family members not only helped to develop Melissa’s soap business, but also played a large part in the conception of her second venture, which came about when her mother developed osteoarthritis. Melissa had heard that CBD (cannabidiol) worked well as a pain suppressant. Even though her mother was against trying any products containing CBD, Melissa set out to further research the hemp extract as an avenue for pain relief. 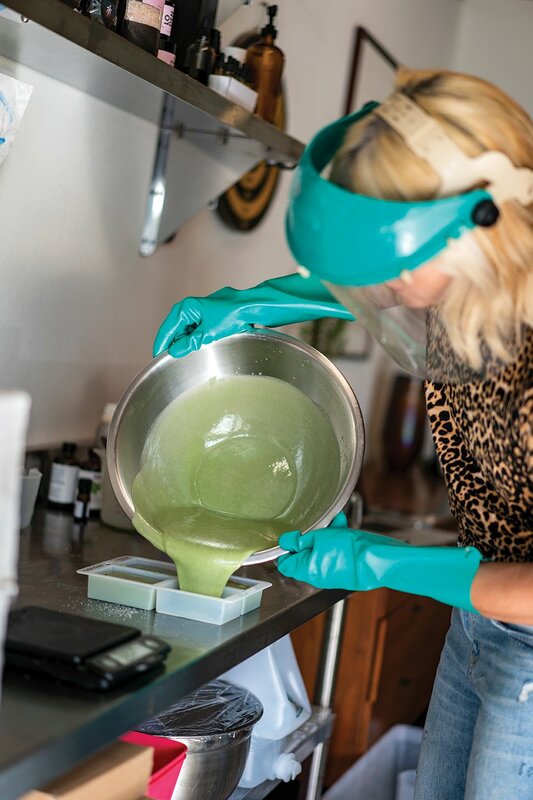 After learning about all of the benefits, she began making her own CBD-infused salt soaks and salves (which her mom now happily uses), under the name Loden. Now, she is finalizing websites (swaysundries.com and loden.club) to sell her products and working toward attractive, eco-friendly packaging.